Restricted to students and Industry Affiliates of UW (Seattle) Computer Science & Engineering. 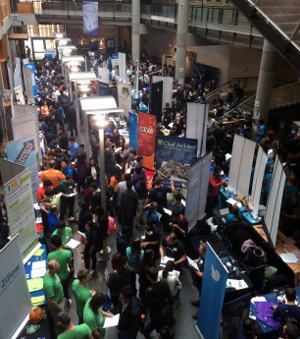 The UW CSE Industry Affiliates winter recruiting fair will be held in the Paul G. Allen Center for Computer Science & Engineering on Wednesday, January 21st (start-up companies) and Thursday, January 22nd (established companies). There is a waiting list for the established company recruiting fair on 1/22/15. Each recruiting session is scheduled to run from 1:30-5:00 p.m. on the respective day. The links below will give you further information about these sessions. Established companies on January 22nd - Registration is closed for January 22, 2015. WAITING LIST ONLY.